Sometimes mistakes happen, as they did this weekend in Maui, Hawaii, U.S.A, in The Fed Cup Tennis Tournament, when Andrea Petkovic played American, Alison Riske, which brought embarrassment all around because they chose the wrong national anthem for introducing Germany to the court, which was sung by a school teacher from Hawaii and they chose the national anthem from West Germany’s rule, “YES”, the version which was made famous by Adolf Hitler, prior to the end of WWII. Ouch! And, how was your weekend? What an introduction for Andrea Petkovic to align her mind with; as she attempted to win this tennis match. Surely, with visions of genocide, torture, gas chambers and death, this didn’t help her to mentally prepare for this match, at all. Not surprisingly, Andrea Petkovic thought about storming off the court prior to the start of the match, but she pretended that she almost didn’t notice at first, but since then, she has taken major offence to the humongous mistake by the tournament organizers to play the wrong song, all together. Just take a look here at the horrible incident in all its horrible nature, down below. This was a mistake, a terrible one! “I thought it was the epitome of ignorance, and I’ve never felt more disrespected in my whole life, let alone in Fed Cup,” said Andrea Petkovic after the match, which she also ended up losing,but luck would have it that the game was stopped by bad weather two times. 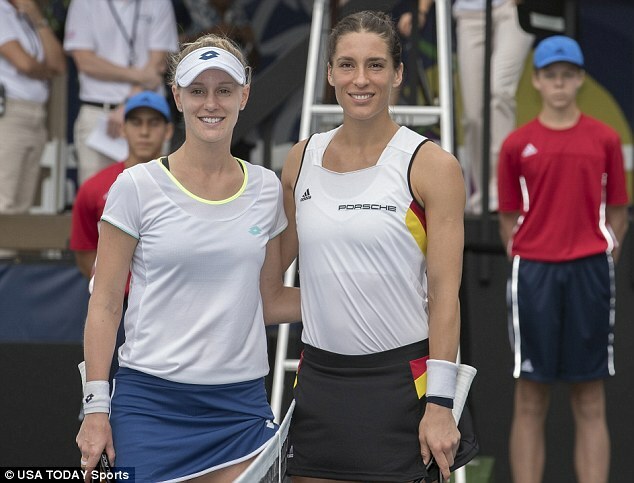 Perhaps, even God was upset by the humongous gaff (mistake) that he decided to rain down on the court of play, so that the game could be continued at a more convenient time, because the match was stopped twice because of delays by rain, until Riske beat Petkovic in straight sets. Perhaps, the opening anthem was a bit of a distraction for Petkovic? Which may have been the reason to see her lose the match, so easily. The incorrect anthem included the first stanza, beginning “Deutschland, Deutschland uber alles, uber alles in der Welt” which was used as Nazi propaganda before the end of WWII. Which translates to “Germany, Germany, over all, over all in the world”, seemingly the school teacher in Hawaii was not aware that only the third verse is now allowed to be sung, due to all of Hitler’s horrible antics prior to his death on April 30th, 1945. A major “Oooops” and at least this brought some much-needed attention to The Fed Cup in Hawaii, but for all the wrong reasons, entirely. You can’t blame the Germans for becoming upset at this major blunder. It will now be interesting to see who wins the match series, when Germany will play the USA in the other tennis matches in the same tournament. Let’s see who wins now in the full Tennis series between the U.S.A ad Germany. We feel Germany might have to take revenge in this Tennis Tournament by winning the series. This mistake reminds us of Borat singing the Kazakhstan anthem here to the tune of the USA anthem in America. The major difference here is that this was “Performance Comedy”, although it was not enjoyed by the crowd, either. History, Humble Pie, Mistakes, Sports, Sports & Gaming Adolf Hitler Tennis, Alison Risk Wins Nazi Anthem, and I've never felt more disrespected in my whole life, Andrea Petkovic I thought it was the epitome of ignorance, German National Anthem played incorrectly at Fed Cup Tennis, Germany vs USA Tennis Nazi Anthem, let alone in Fed Cup, Nazi anthem in Hawaii USTA FED CUP, Nazi anthem USTA Fed Cup Tournament Mistake, Nazi Tennis Mistake, Oops Nazi Anthem Tennis, Petkovic played Nazi anthem, U.S.Tennis Association Apologizes for Playing Nazi Anthem.